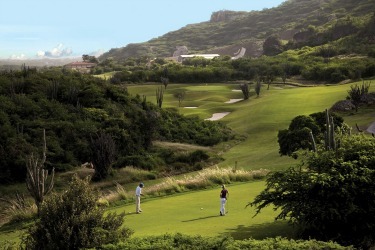 The Curacao Golf Course Old Quarry is consistently rated among the Caribbean's top public courses. 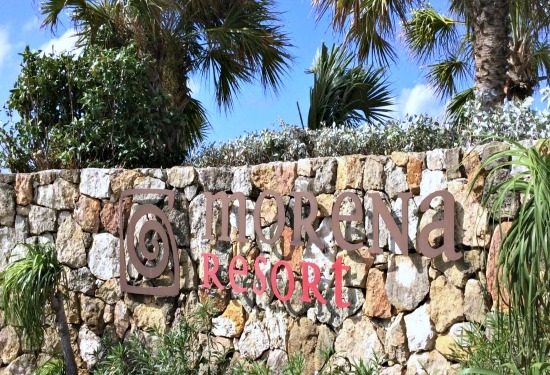 It offers a one-of-a-kind round on the island. Designed by Pete Dye, the course opened in 2010 and can be found on the south-east corner of the island as part of the Santa Barbara Resort. Plus, you do not have to be a guest to play it. When playing a round on the Old Quarry course, take the time to soak up the scenery. The course is part of an old rock quarry. Feel free to take some pictures, as you will never be rushed on the course. If you are not comfortable playing in the wind or you don't believe you have enough golf balls to finish the round. Do not be afraid to move up a set of tees. Leave your ego at the hotel so you play and have fun. There are also significant undulations and inclines that follow the natural terrain of the old quarry. 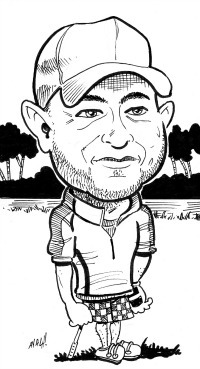 I suggest to purchase the yardage book at the pro shop, since the carts are not equipped with GPS. 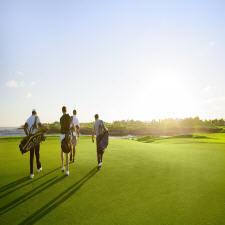 Also, since the Old Quarry is not golf course to walk, make sure to stock up on cold drinks as there is quite a distance between the 9th and 10th hole. Right from the start the Caribbean Sea appears down the entire right side. At hole #1 (392-yard par 4) you must stay left if you want to have a chance for par. The first 3 holes are a good warm up for you to get accustomed to the wind. Depending on the time of day, the wind will vary from a 1 to 3 club +/- strength. There is a selection of tee boxes (5 in all), and therefore, you can choose the appropriate level of difficulty for your handicap. & a slope of 133. If you have never played a Pete Dye-designed course you will encounter holes which will have blind spots that could affect the play of your next shot. 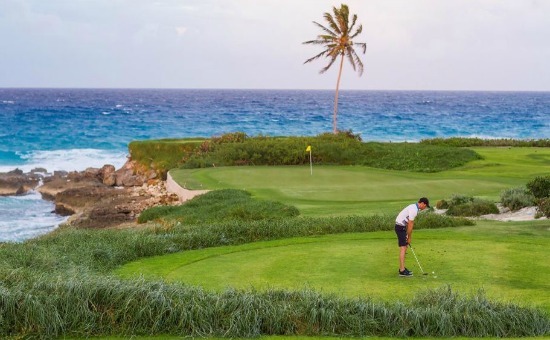 The greens roll true and are in excellent condition Credit: Caribbean Golf Getaways. 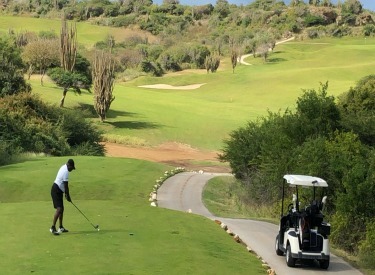 This Curacao golf course is windy! Hole # 3 (par 3) in particular has you teeing off with the Azure Ocean at your back and towards an uphill green. There are three unique layouts which make up the golf course. There is the Caribbean Sea, the waters of Spanish Water bay, and the desert-like terrain at the foot of Mount Tafelberg. If you like wide fairways, then you will enjoy this Curacao Golf Course, as there are holes which open up in several areas. Try and play down the middle as it will give you your best chance to score well when you approach the greens. Bad shots will mean a lost ball into the desert brush and cactus. Your putts will stay on-line as the greens are fast and in excellent condition. You will need to stay straight on the par-4 466-yard 15th. As you are surrounded by desert and cactus, you should keep an eye out for wild goats, iguanas and wild donkeys that roam free on the golf course. 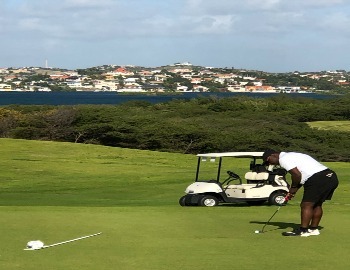 Finish on this Curacao golf course with 425-yard par-4 18th hole that features a wide-open fairway with some strategically placed bunkers along the way to the green. You will love this course because of its natural beauty, the challenges to your game, and its 19th hole restaurant and bar. Drive up to it right off the finishing hole. Located right on the water, the restaurant has good food and ice-cold beer. Give the Old Quarry golf course a try and you will not be disappointed.